Last Friday, June 10, Float hosted its first-ever one-day symposium on mobile learning at Bradley University in Peoria, Illinois. Presenters from a variety of backgrounds spoke to nearly 100 participants on mobile learning pedagogy, technology and mobile brand advocacy. Before continuing, I wanted to introduce myself. My name is Adam Bockler, the social media marketing specialist for Float Mobile Learning. The symposium was my first day on the job with Float, and I wanted to share what I found to be nuggets of useful information. 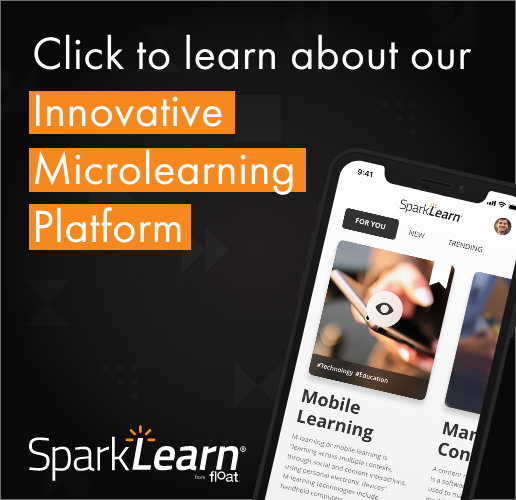 I’m looking forward to connecting with more Float Mobile Learning readers in the coming weeks. Jim Ferolo kicked off the day, welcoming Bradley University president Joanne Glasser. Following them, Float managing director Chad Udell hosted the keynote session setting the stage for the day. Josh Campbell, the owner of Magic+Might, talked about multiscreen design strategies. When he opened the floor for questions, someone asked what happens when you’re designing for the client who wants everything. Campbell urged designers to get their clients to know they should strive for a benchmark. Reach that benchmark first, let them learn from that benchmark and then try other solutions. Campbell also noted different design objectives for Apple and Android, saying that Apple’s user interface features were faster, but Android allows you easier Market approval. From there, I hopped over to see the end of Jim Ferolo’s presentation. The head of Bradley University’s Department of Interactive Media, Ferolo examined mobile interactions that are tied to physical location and advertising modalities. He and a team of students also presented data from a research project one of his classes conducted to see how college students use mobile devices. The dual tracks of business and strategy, along with design and development, converged for an all-group session conducted by Kevin Hoyt, an Adobe evangelist who showed how easy it is for CS 5.5 to create mobile applications using Dreamweaver and Flash Builder. Hoyt recognized many developers might groan at this thought. Upon creating a new project, Dreamweaver spit out a bunch of unnecessary code. “Dreamweaver is throwing up again,” a joke he made that was tweeted by Lyndon Perry. But he showed the mobile features that have been integrated into Adobe’s new releases. Throughout his demonstration, Hoyt noted that Adobe is noticing three trends. One, he said, was the proliferation of devices. There is no codified screen resolution for smartphones and that gets even more complicated with tablets. Another trend was developing with web standards. Dreamweaver now lets you take a live view of an app with jQuery and CSS added. The last trend Hoyt said Adobe was noticing is user expectations with regard to an app, “and they expect a good one.” Users will review the experience, and they’ll trash it if the app is bad. After lunch, the entire group was brought together again to hear from technology strategist and futurist Dr. Gary Woodill, Ed.D., who talked about the past, present and future of mobile learning. “If considering mLearning,” Woodill said, “ask why.” Woodwill said the future is not evenly distributed. For some, it’s here or has already happened. For him, it’s about finding what’s happening now that’s hidden. “It’s a lot of fun,” he said. Woodill calls himself a “recovering academic” after 40 years in education and nearly 20 in eLearning, teaching students of multiple ages and figuring out different learning theories in how best to reach them. “Different experiences influence how they learn,” he said. Not purely a philosophical presentation, Woodill offered his views on design. “An engaging experience is important and key to a design’s success,” he said, according to Heather Ford. The group broke off once again, with the design and development group hearing from Float’s own Dan Pfeiffer while the business and strategy group heard from Jeff Tillett. Tillett’s presentation was about “how the cross the chasm,” as he put it, referring to how business can leverage mLearning. He thinks that many think mobile learning is misunderstood and daunting, but he said something as simple as listening to a podcast can be mobile learning. In order for successful learning, Tillett said, the students need to be motivated and engaged. Steven Hoober was up next on the design/development track. “Every design idea has flaws,” he said, a snippet caught by Dan Pfeiffer. “Challenge yourself to a better design.” Float’s managing director Chad Udell presented the last session I was in. Udell talked about understanding mobile learning in context, suggesting that fictitious devices such as the Tricorder from Star Trek and KITT the supercar are examples of contextual aware devices because they knew what the user was looking for when using that device. To end the day, we gave away several licenses of PhoneGap and Adobe CS 5.5. “In the age of cloud distribution,” Steven Hoober joked, “@visualrinse has no actual boxes of stuff to give away at the drawing at #float2011.” Many thanks to our sponsors for providing these giveaways, as well as our enthusiastic participants. We are so happy to have provided you with a great day of learning. “Thanks @floatlearning for a [great conference] on mobile,” said Jeff Tillett on Twitter. Over the coming days, Float will be posting the slides and presentations of the speakers. Were you there at the event? What did you think? Leave us your thoughts here in the comments.